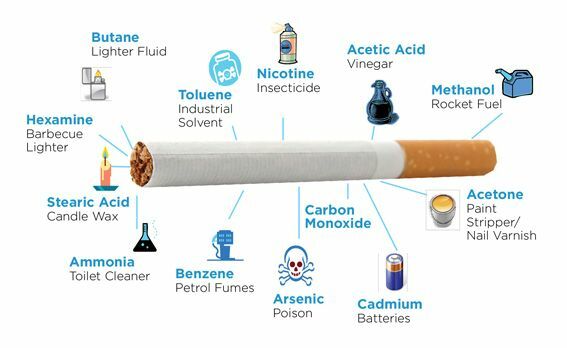 Except the obvious tobacco and nicotine content of cigarettes, there are over 599 documented chemical additives in cigarettes that the tobacco industry don’t want you to know about. More than 100 of those that have a scientifically been shown to have pharmacological (drug-like) effects that are intended to increase the addictiveness and mask symptoms and illnesses associated with smoking behaviors . At least 33 of these additives are well documented carcinogens (substances that induce cancer) according to the U.S. Department of Health and Human Services. When cigarettes are lid, the heat catalyses chemical reactions that gives rise to another 4 000 to around 7 000 harmful chemicals. Below is a list of the most shocking additives amongst the ones mentioned above. Arsenic: Poison – Used to kill Napoleon. 4. DDT: A banned insecticide. Carbon monoxide: Poisonous and lethal gas.